This dish is very common and well known in Asia countries such as Singapore, Hong Kong and Malaysia. You may easily get the dish at our hawker centre, coffee shop (煮炒摊 – “Zhu Chao Tan”) and even Chinese restaurant. Singapore normally uses Kailan for this dish, while Malaysia and Hong Kong use lettuce. I personally prefer the lettuce as it yields more crispy texture and the greeny taste is milder. It is very simple dish to cook at home, in fact. I used the same recipe for fried fish dish. Its taste is fantastic, even on vegetables. For those kids who do not take vegetables, this recipe makes it great to eat, both adult and child will sure like it! 1) Boil a pot of water over high heat. When water boiled, blanch washed lettuce leaves till 80% cooked to retain its fresh green colour. Drain, and reserve for later. 2) Clean the wok. Add vegetable oil into wok, fry ginger strips over medium heat, until crisp and golden brown. Remove from wok, and set aside. 5) Using the same wok, add shallot. Fry shallot till lightly browned over medium heat. Then, turn fire to low heat. 6) When shallot turns brown, quickly add in light soy sauce. Add in sesame oil after the “sizzling effect” created by the mixture of hot oil and soy sauce. Heat off. Pour the sauce over lettuce. Add oyster sauce on top of the vegetables. Serve. This vegetables dish counts 220kcal per portion. Tips: Add some sugar in the boiling water for blanching, it helps to enhance its bright green colour. 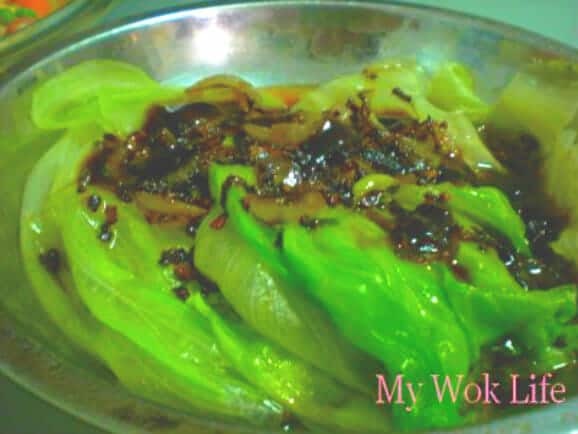 * Change type of vegetables to Kailan or “Xiao Bai Cai”, as desired. I love yr blog, cos i also a vege lover. There is another method to cook the Lettuce…. U can try to use the Szechuan Beancurd (white type) + small chilli padi (optional) to fry the lettuce.. it also very delicious. I wanted to shout a big “HOWDY” to you! ehehe…I stumbled upon your blog by chance..I must say you are a great cook! :)I do like your version of Pineapple cookies, its unique. I hope you would consider adding the Imperial Measurements for the benefit of US readers, including me, of your blog. Thank so much! God bless you and your loved ones! I wish you could visit my blog more and try my recipes. Thanks for leaving me your comment and idea. Yes, I love the preserved beancurd with lettuce! I I used to cook it and have not cooked for long time, but I just had it 2 days ago when i was in Hong Kong. Soooooo deliciuous… You reminded me to cook it again.. Thanks!